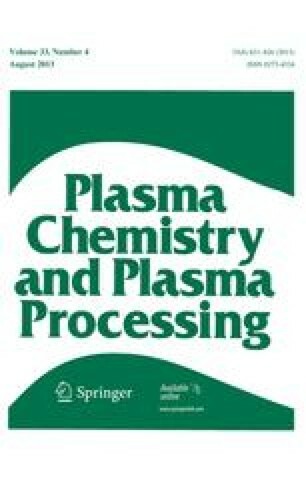 For low-pressure, high-density plasma systems, etch products can play a significant role in affecting plasma parameters such a.s species concentration and electron temperature. The residence time of etch products in the chamber can he long, hence depleting the concentration of the reactants, and leading to a decrease in etch rate. We use a spatially averaged global model including both gas phase and surface chemistry to study Cl2 etching of polvsilicon. Etch products leaving the wafer surface are assioned to he SiCL2 and SiCl4. These species can be fragmented and ionized by collisions with energetic electrons, generating neutral and charged SiCl, products (x=0–4). Two limiting cases of the etch mechanism are found. an ion flux-limited regime and a neutral reactant-limited regime. The high degree of dissociation in high-density plasmas leads to the formation of elemental silicon, which can deposit on the chamber walls and wafer surface. We include surface models for both the wall and the wafer to better understand the role of etch products as a function of flowrate, pressure, and input pwer. A phenomenological model for the surface chemistry is based on available experimental data. We consider the two limiting conditions of nonreactive and reactive walls. These models are perfectly reflective walls, where all silicon-containing species are reflected; and reactive walls, which act as reactive sites for the formation of SiCl2 and SiCl4 etch products. The two limiting conditions give significantly different results. A decrease in the absolute atomic silicon density and a weaker dependence of etch rate on flowrate are observed for the reactive wall.